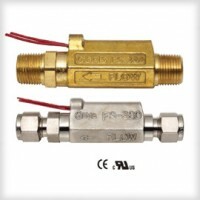 This rugged inline flow switch uses 100 micron filtration and are less susceptible to clogging than other high-pressure inline flow switches. The one-piece magnetic PPS composite piston makes the FS-380 ideal for high-pressure applications such as industrial cleaning equipment. The FS-380 is also an excellent choice for semicon cooling applications where simple design and reliable operation are required.